When we read Genesis chapter one we usually see only one story there, but there are actually many stories. Why don’t we see these multiple stories? Is it because we don’t open our eyes? What is it that we fail to see? The Hebrews style of writing is prolific with a style of poetry unfamiliar to most readers of the Bible. This poetry is nothing like the poetry we are used to reading today and therefore it is hard to grasp and see. The most common form of Hebrew poetry is called parallelism. Parallelism is when the writer says one thing in two or more different ways. Genesis is full of this poetic form. Often we overlook what the Bible is telling us because we are not recognizing what the poetry of a passage is attempting to convey. The first creation story is found in Genesis 1.1 “In the beginning God created the heavens and the earth.” The Hebrew word “bara” is a verb and is usually translated as “create” as an intended and purposeful action. In Genesis 1.3-13 we have the first three days of creation. These are the days of separating. On the first day God separated light and darkness. On the second day God separated the waters above from the waters below forming the sky and the seas. On the third day God separated the land from the water forming dry land. 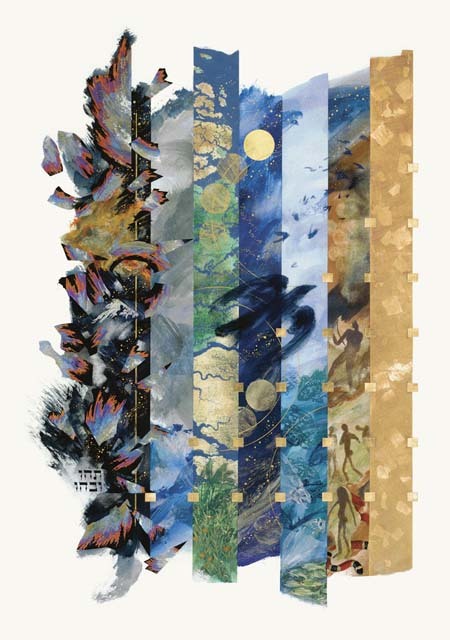 In Genesis 1.14-31 we have the second set of three days of creation. On the fourth day God filled the light with the sun and the darkness with the moon and stars. On the fifth day God filled the sky with the birds and the sea with the fish. On the sixth day God filled the dry land with the animals and man. Notice the correlation between the first set of three days of separation with the second set of three days of filling. The seventh day – rest. This is pure poetry in motion. There is so much more. Most modern western thinkers view the Genesis events in step logic. This is the idea that each event comes after the previous forming a series of events in a linear timeline. But, the Hebrews did not think in step logic but in block logic. This is the grouping together of similar ideas together and not in chronological order. Most people read Genesis chapter one from a step logic perspective or chronological, rather than from the block logic so prevalent in Hebrew poetry. The story of creation is so much more that a sequence of events, there is so much here that is unseen, but can be seen if we have eyes to see. There is separation, filling, rest, breath, humans created as both physical and spiritual, seasons, days, years, and eternity. May you slow down so that you don’t miss a thing, may the eyes of your heart be enlightened. May you be fully present right here right now. may you come to see the reality of God is at hand upon us, among us, near, here. May you come to see that everything is spiritual. Finally here’s an excellent about the poetry of Genesis – enjoy!